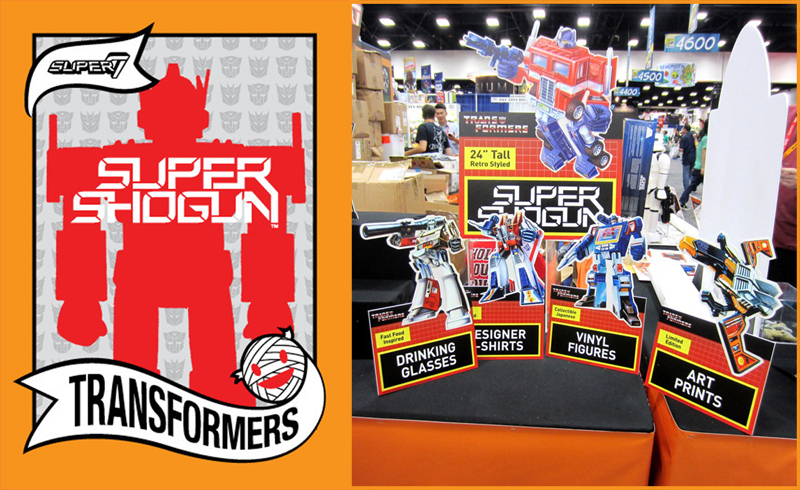 Joining the resurrection of the original Alien action figures (find out more here), Super7 are proud to announce they will be working on yet another cult 80’s IP… with the reveal of the Transformers Super Shoguns! OPTIMUS PRIME, plus a whole host of other Autobots and Decipticons, are due to be realized as jumbo-scaled, 24” tall retro-bots, complete with rocket punch (! )- making these guys among some of the largest TRANSFORMER collectibles ever produced… As part of a planned multi-year licensing agreement with Hasbro, Super7 will also produce a slew of other TRANSFORMERS merchandise in a variety of categories, including designer Japanese vinyl figures, retro-themed glassware, designer T-shirts, and limited edition art prints… Stay tuned for more news on this highly promising project soon.